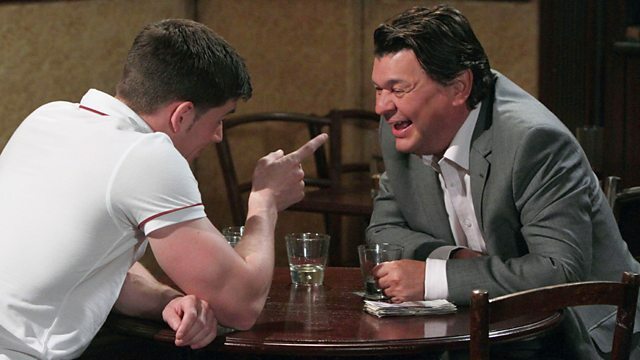 Derek is livid to discover he is a pawn in Joey's scam to pay Lucy's debts. An emotional Janine struggles to cope without Michael by her side as she receives some important news. Joey volunteers to keep Bobby occupied. Lucy lies to Tanya that Ian’s wired her money for the debt collector. Joey refuses Derek’s offer of lunch. Bobby hides his things when a man calls threatening to take their belongings. Joey vows to get Lucy £500 and challenges Derek to a drinking competition. Derek reminisces about lighting fireworks in a car park on Joey’s 7th birthday. After drinking all night, a drunk Derek staggers into Patrick’s table. Jean reveals Joey’s been drinking water. A sober Joey remembers his 7th birthday too – Derek threatened to push his mother off the car park roof. Joey presents Lucy with £500 , Lucy invites him to stay. Derek crashes in, warning Joey no-one takes him for a ride and gets away with it. Morgan gives Janine a family picture. Janine cries at the news that Scarlett should be home in a week, terrified she’s all Scarlett has. Whitney pleads with Michael to support Janine. Janine rips the family picture in half, blotting out Michael. After watching Billy and Lola with the baby, Michael returns to the hospital and takes Janine’s hand. At the hospital, Lola’s nervous around her baby. Billy unsuccessfully appeals to Janine for his job back. On the Square, Billy’s heralded a hero. Cora returns Lola’s toy tiger. Billy’s still frosty with Jay but relents when Lola pleads she needs support. Lola names her baby after a friend in care - Lexi Billie. Everyone’s clubbed together to buy Billy his Olympic torch. Billy’s relieved when Janine texts re-hiring him. Denise finds Zainab asleep in the Minute mart.